Human Rights Initiative, Open Society Initiative for Europe, and Arcus Foundation have just released a joint call for proposals for “Reaching the Moveable Middle,” an outcome of the September Barcelona “Reaching the Moveable Middle” gathering which The Lafayette Practice designed and coordinated in consultation with the Open Society Foundation. The deadline for submitting proposals is March 6, 2015. This entry was posted in Blog on February 12, 2015 by Matthew Hart. IHRFG recently held a two-day conference to find new approaches to combating ongoing human rights violations. Following the event, the IHRFG blog shares reflections from grantmakers who came together to explore this topic through various lenses. Click here to read more lessons and join the conversation! This entry was posted in Blog on February 6, 2015 by Matthew Hart. In 2014, Hart continued to serve as Board Chair of The Calamus Foundation (DE) and as a Board Member of Funders for LGBTQ Issues. Hart also served as Funders Concerned About AIDS (FCAA)’s Senior Strategist for Europe. In this role, Hart traveled to London, Amsterdam, San Francisco, and Geneva for meetings, trainings, and info-sessions with key members and potential members, staff, consultants, and other stakeholders. Hart collaborated on FCAA outreach, communications, meeting development, and stakeholder engagement for the June 2014 Geneva conference “Sustaining HIV and Human Rights Programming in Challenging Contexts: Continued Criminalization of Key Populations and Shrinking Resources,” co-hosted by FCAA and UNAIDS. Hart also attended the International Human Rights Funder’s Group (IHRFG) 2014 San Francisco Conference as a representative of FCAA. In April 2014, The Lafayette Practice released a new report analyzing and comparing the practices of eight premiere international Participatory Grantmaking Funds (PGF). The funds included in this report are: Disability Rights Fund, FRIDA – Young Feminist Fund, GMT Initiative, HIV Young Leaders Fund, International Treatment Preparedness Coalition (ITPC) HIV Collaborative Fund, Red Umbrella Fund, Robert Carr Networks Fund, and UHAI – the East African Sexual Health and Rights Initiative. For more information, read: “Paradigm Shift: Participatory Grantmaking Comes of Age”, by Matthew Hart for IHRFG. In April 2014, Matthew Hart facilitated a day long Fundraising Training Session focused on Individual Donations for ILGA-Europe staff and Board members. Hart developed and delivered a double session on individual donor development, campaign management and NGO best business operations practice. These sessions were delivered to a standing-room-only group of 40 participants. Hart developed and moderated the second plenary for the Summit: “Mobilizing Leadership.” Watch a video of this plenary here! Hart also convened and facilitated a day-long donor stakeholder meeting with private philanthropic partners. 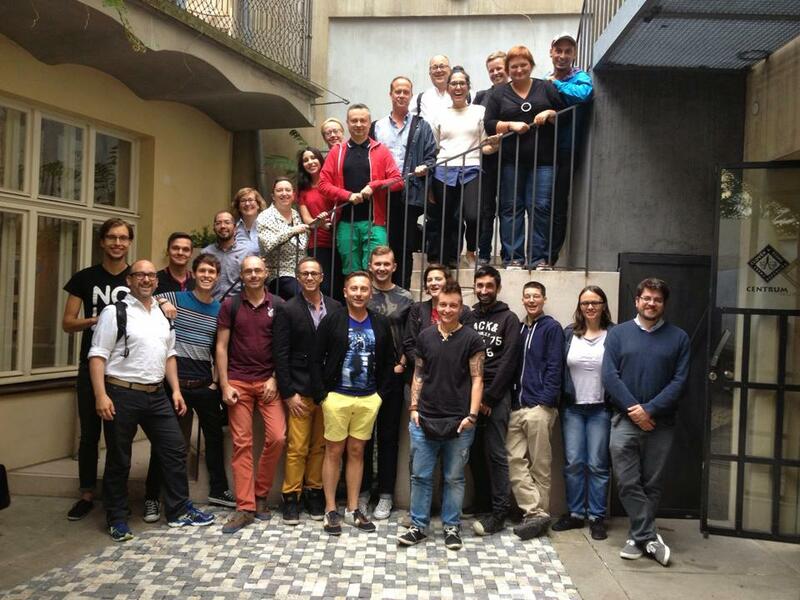 Designed, and coordinated by Prague Pride, Open Society Foundation, and The Lafayette Practice and held during Pride Week in Prague, August 13-15, 2014. Beginning in May 2014, TLP worked to organize a three-day training for a pre-selected cohort of Open Society Foundations (OSF) grantees/LGBT organizations in the Eastern and Central Europe regions. The training centered on cultivation of domestic philanthropy with particular attention to recruiting individual private donors and generating corporate and local business support. Through tailored organizational analysis, key trainings, and strategic fundraising planning support, TLP aimed to support each organization to articulate their skills, weaknesses and opportunities, and build strategic capacity in new areas of fundraising and organizational development. Nine groups were represented at the training: Accept of Bucharest, Romania; Estonian LGBT Association of Tallinn, Estonia; Hatter of Budapest, Hungary; KPH (Campaign Against Homophobia) of Warsaw, Poland; Lithuanian Gay League (LGL) of Vilnius, Lithuania; Mozaika – Association of LGBT and their friends of Riga, Latvia; Prague Pride and Proud of Prague, Czech Republic; and Zagreb Pride of Zagreb, Croatia. Reaching the Moveable Middle: Counteracting the Attack on LGBTI and Reproductive Rights in Europe. Designed and coordinated by The Lafayette Practice in consultation with Open Society Foundation, and held in Barcelona from September 28-30, 2014. Reaching the Moveable Middle created a unique space, bringing together donors, activists, and NGOs. This meeting was the first of its kind, convening LGBTI activists, sexual health and reproductive rights (SHRR) activists, and faith communities to explore the creation of a shared framework for activities and strategy development. This stage one meeting was intended to set the groundwork for key areas of shared activities, strategy and knowledge development, and donor alignment. In total, sixty-nine participants gathered for three days. This included ten OSF staff, fourteen panelists, and thirty-eight general participants. In addition, seven donor representatives attended, from Mama Cash, Astraea, Arcus, Wellspring, and Sigrid Rausing Trust. This entry was posted in Blog on January 20, 2015 by Matthew Hart. We’re excited to share that Matthew “Matty” Hart’s article “Paradigm Shift: Participatory Grantmaking Comes of Age” has been published in the monthly e-newsletter and the online blog of the International Human Rights Funders Group. Hart’s article discusses our study, Who Decides: How Participatory Grantmaking Benefits Donors, Communities, and Movements. Check out the article and participate in the online conversation at the IHRFG blog. This entry was posted in Blog on December 13, 2014 by Matthew Hart. The Lafayette Practice’s Matthew “Matty” Hart recently moderated a powerful panel discussion at the ILGA-Europe Annual Conference 2014 in Riga, Latvia. The Conference second panel ‘Mobilising Leadership’ brought together activists representing diverse aspects of LGBTI movements in different European countries. Among voices from Germany, Georgia, Bosnia and Herzegovina, Belgium and Cyprus, and Latvian LGBTI movement. ​This session focused on the dynamics and differences in leadership that each of the individuals and their organizations bring to the movement. Panelists: Julia Ehrt, Executive Director of Transgender Europe; Natia Gvianishvili, Program director at the Women’s Initiatives Supporting Group, Georgia; Linda Freimane, Mozaīka, Latvia; Emina Bošnjak, Programme Manager, Sarajevo Open Centre; Yves Aerts, Coordinator, çavaria, Belgium; and Costa Gavriliedes, Accept LGBT Cyprus. Response by Ulrike Lunacek, European Parliament. Video of the panel was livestreamed and is now available to watch on vimeo! More about the panel below the video. This entry was posted in Blog on November 12, 2014 by Matthew Hart. Today in the Financial Times, read Joy of Giving By Sarah Murray. An interesting examination of US based LGBT Donors and our history and predicting trends. “Since Rand Skolnick died from cancer in 2008, Terrence Meck has been using the funds his partner left to give away $1m a year, with half going to lesbian, gay, bisexual and transgender (LGBT) youth programmes and the rest to health initiatives. For Meck, this honours the man he loved. However, his strategy also reflects a broader trend among gay philanthropists – their giving increasingly extends beyond LGBT causes. Of course, philanthropists in the gay community make plenty of gifts to support their peers. “I keep giving because all LGBT people have to be on the front lines in winning their own equality,” says Tim Gill, the entrepreneur and philanthropist who founded Quark, the developer of page-layout software, and created the Gill Foundation in 1994. This entry was posted in Blog on September 20, 2013 by Matthew Hart. The Lafayette Practice is on its way to becoming the place to help you help others. This entry was posted in Blog on May 12, 2013 by admin.